Common applications include the drilling of through holes and blind vias, with the additional ability to cut large mounting holes, or full perimeter cuts of irregular board contours. The MicroLine 5000 UV laser is a universal tool – and thus suitable for cutting all industry-standard panel sizes with dimensions of up to 21” x 24” (533 mm x 610 mm). 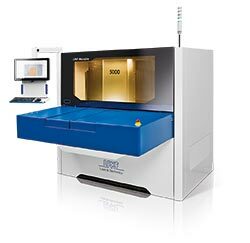 The 20 μm high quality UV laser kerf width allows for cutting of even the most delicate contours at high speeds. The high-quality attributes of the UV wavelength allow for the cutting and drilling of delicate materials with minimal heat affected zone – and the proof is in the results: clean side-walls with precise dimensions and virtually zero debris. LPKF MicroLine UV laser systems don’t compromise quality or precision over cost-efficiency. 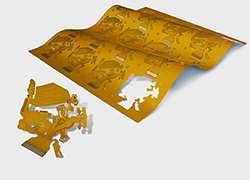 These three principles, which are critical to any manufacturing operation, are the driving force behind the development of the MicroLine 5000 series UV lasers systems from LPKF for the drilling and cutting of flexible PCBs.